I recently did an online radio interview with Health Professional Radio about my experiences and my upbeat message. My personal goal is to try to inspire as many people as possible — and to encourage us all to live life every day. With that in mind, I recently did an online radio interview with Health Professional Radio about my experiences and my upbeat message. To listen to the interview, click the play button below. 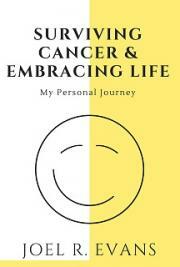 To get a FREE copy of Surviving Cancer and Embracing Life: My Personal Journey, click the book cover.